With the new film Water for Elephants arriving in theaters, it's a good time to reflect on how elephants actually make their way from the wild into captivity. "The traditional method for capturing many social creatures, including elephants, gorillas, chimpanzees, and many others, was—and remains—to kill the mothers. About elephants it was said, "The only way to capture a living animal was to kill the suckling females or the herd's leaders. Hagenbeck [a famous circus man] found himself 'too often obliged to kill' elephants who were protecting their young by using their bodies as shields." 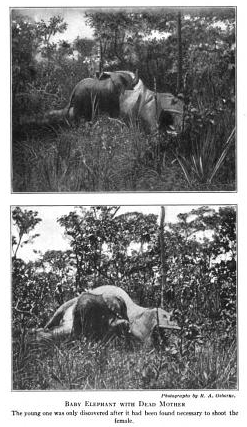 "Soon Dominick [an elephant capturer] encountered a female with a young calf; after several shots…the female was dispatched with a shot in the left eye. The calf was roped to a tree, where it 'churned up the soil with its small tusks, bellowed and moaned, charged backwards, stood on its head, and foamed at the mouth in rage as bloodshot eyes protruded from its head.' Three remaining calves were soon captured as well, one dying of suffocation after having its trunk pulled between its forelegs and tied to its rear legs so that it 'breathed with difficulty and lay on the ground like a large gray sack.' Another calf died during the night of wounds sustained in the capture, but Dominick had still managed to secure two calves from the herd and soon added three more to his collection. Two died a month later, but the remaining three apparently thrived [sic] in their new environment, and one found its way through Hagenbeck to the Berlin Zoo." "One of the wild elephants in the struggle got half-drowned, and then entirely strangled; she just staggered to the shore, and then dropped dead without a struggle. It was really quite piteous to see her poor little young one, about ten days old; she kept walking round the body, pushing it and trying to coax her dead mother to rise up; then uttering the most heart-rending cries, and lying down by her side, as it were to comfort her." "A hunter, Hermann Schomburgk, shot his mother. He describes it himself: 'She collapsed in the rear and gave me the opportunity to jump quickly sideways and bring to bear a deadly shot, after which she immediately died. Obeying the laws of nature, the young animal remained standing beside its [sic] mother….Until my men arrived, I observed how the pitiful little baby continuously ran about its mother while hitting her with his trunk as if he wanted to wake her and make their escape'." Needless to say, I will not be seeing the movie Water for Elephants. It's 45-year-old "star" elephant, Tai, was captured in the wild in 1966. Does she remember seeing her mother slaughtered in front of her eyes? Did she try in vain to a rouse her mother from death? What was it like for her to be roped and chained and shipped to the other side of the world, so she could used as "entertainment"?